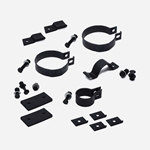 This kit has the upgraded exhaust clamp kit, black rubber reinforced insulators, and all US hardware (nuts, bolts, washers etc) all US made products to upgrade the clamp kit. © rfjp.com 2018. All Rights Reserved.